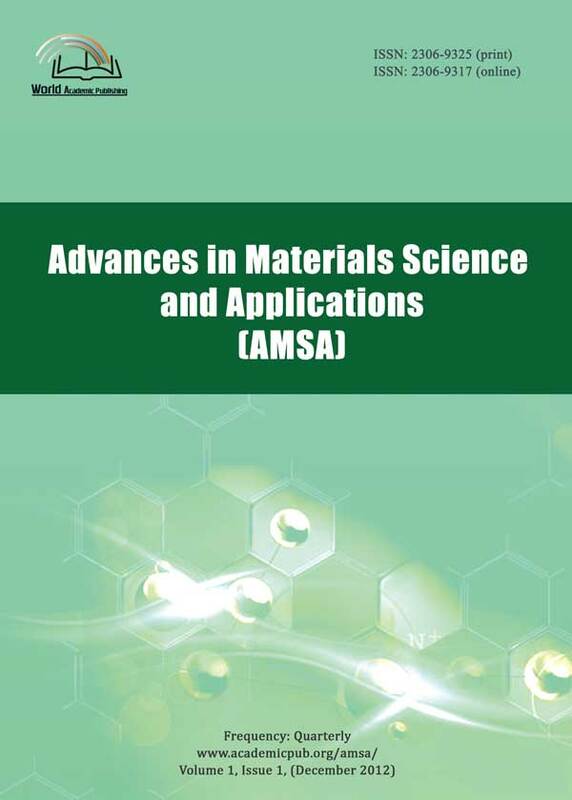 Advances in Materials Science and Applications (AMSA) is a multidisciplinary peer-reviewed journal. It investigates all aspects of materials science from the fundamental properties and characteristics to the industrial applications of materials, with its emphasis on biomaterials, nanotechnology, electronic, optical, and magnetic materials, composite materials, etc. Original papers are encouraged concerning theoretical and experimental issues of materials science and applications. 1, AMSA Book on "Research and Innovation in Carbon Nanotube-Based Composites"has been released. 2, AMSA Book on "Recent Advances in Composite Materials for Wind Turbine Blades"has been released. 3, AMSA now is a member of CrossRef and has joined CrossCheck to fight against plagiarism. Ensure high ethical standards for all of the submitted papers. Abstract:An experimental investigation was conducted to provide further insight into the material properties of UHPC. The aspects of UHPC performance investigated in this work included dimensional and chemical stability, sorption resistance, and freeze-thaw durability. UHPC was found to produce the desired balance of dimensional and chemical stability, and distinctly low sorptivity and water absorption capacity. The drying shrinkage of UHPC was 25% less than that of normal-strength Portland cement concrete. The moisture sorptivity of UHPC was an order of magnitude below that of normal-strength concrete. The heat of hydration of the UHPC paste was about one-third that of Portland cement paste used in a normal-strength concrete mix. The UHPC paste, unlike a normal Portland cement paste, exhibited autogenous shrinkage; the amount of this shrinkage was, however, relatively small. These test results were explained based on the distinctly low water content, the high pozzolan content of the cementitious binder in UHPC, and the high dosage of superplasticizer used in UHPC mixtures. The fact that water content of UHPC is not adequate for thorough hydration of cementitious particles seems to be a significant factor influencing those aspects of the UHPC behaviour evaluated in this investigation. Abstract:A method for detecting the application of an unexpected dangerous load was investigated. An acceleration behavior of crack growth due to the application of overload and or underload during fatigue crack growth test with constant stress amplitude was observed. In some cases, the acceleration of crack growth brings catastrophic failure in machine structure. Therefore, it is useful for machine maintenance to know whether an unexpected load was applied or not by doing a daily inspection. In the present study by using center-crack specimen, a simple method of detecting the application of overload or underload was investigated. Such an unexpected load can be detected by the waveform of the function of stress and strain in the vicinity of the crack.